ROAD TOWN, Tortola, VI - Supervisor of Elections Ms Juliette Penn is encouraging all eligible persons to register to vote by September 3, 2018, for inclusion in the 2018 Official Voters' List. Ms Penn added that other qualifying requirements are ‘Belonger Status’ and persons being domiciled and resident in the Virgin Islands (VI) or domiciled in the VI and resident in the United States Virgin Islands (USVI). A naturalisation certificate can also be used, provided it is dated before June 15, 2007. What district to vote in? In accordance with Section 17(1) of the Elections (Amendment) Act No. 14 of 2011; persons who have moved their place of residence and wish to transfer are also urged to apply for a transfer on or before September 3, 2018. Supporting documentary evidence can be in the form of a Cable Television, Water or Electricity bill, a rent receipt or a notarised document, stating the new address, the GIS press release stated. “Registration and Transfer forms are available at the Office of the Supervisor of Elections, Post Offices throughout the Territory, the District Offices on Anegada and Virgin Gorda and the Government Office on Jost Van Dyke” according to Government spokeswoman Sheriece Smith. For more information persons are asked to contact the Office of the Supervisor of Elections at (284) 468-4380 or 468-3701 Ext. 4380 between the hours of 8:30 a.m. and 4:30 PM. The Information Officer noted that “persons may also visit the office located on the ground floor of the Ulric Dawson’s Building #6 in Road Town”, on Tortola. 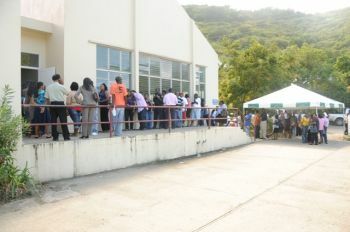 Many political observers said because of the collapse and ‘lame duck status’ of the ruling National Democratic Party (NDP) and with many of the party founders running away from the new elected co Leader Hon Myron V. Walwyn (AL), the party will hold on to power and will not call elections until summer of 2019. Many residents, civil society and persons in the United Kingdom (UK) have all called for fresh elections to give the recovering Territory a new mandate. This notice is too short. A months notice should be given. Ok people, according to this story, It states that registration has been ongoing, which means you could have registered since the beginning of the year, and now the cutoff date is September 3rd. We had months to register. We register all the time and this is a reminder to don’t forget to register by the cutoff date. I agree with you, she up to no good. Look at the short notice she giving one week. Why not mention this about a month ago like on August 3rd. What happens to our children who turn eighteen the next day. Suppose an election is call This will be an denial of their constitional rights. You too for obviously you know who they are. Speak up! Date certain for holding general election is urgently needed. In addition to leveling the playing field for those wanting to partake in the electoral process, it improves the effective management of Elections. By the way, change the name from Office of Supervisor of Elections to Election Office........etc. Getting back to the date certain for election, the UK, US......etc have date certain for election. If not a date certain for election, government should provide at least a 90 day notice for a general election. Moreover, why such a short notice for registering to vote? Does this mean that an election date is nigh? A date certain for election would remove all this speculation and the election list could be updated up to 2 weeks before an election. Further, with technology, preparing the election’s list should be simplified, should it not? Nonetheless, predict that election will be set for summer of 2019, for the NDP will milk the time to the end, hoping for a miraculous turn around. The NDP is in a lame duck status, country is stuck at top dead center, is in urgent need of recovery.....etc so lets vote and now. Dislike snap election but given the current situation, let’s roll. It is high time to plan our work and work our plan. #Lets roll. Something about this isn't right. What about persons who will be making 18 later in September or even later in the year? No election date has been announced. Not fair at all. I am saddened that the Supervisor Of Elections did not make is clear that the Voter's List is updated on Sept 30 of each year under the continuous voter registration system. Its has nothing to do with whether an election is coming or not, as persons are assuming. Yes we have an election due next year. However, that is another issue. What people want to know, is with continuous voter registration, would there be a cut off in 2019 since it is anticipated that election would be around the same time as the 2019 cut off time for voter registration.